BATON ROUGE — Miss Jessica Breaux was named the 2012 Parkview Baptist Homecoming Queen. 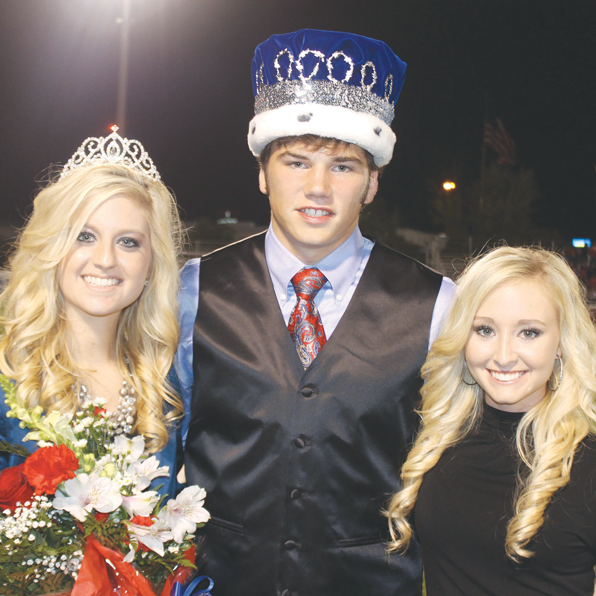 She was crowned by the 2011 Homecoming Queen, Chelsea Rentz. Chelsea is a freshman at LSU where she is studying to earn a degree in Child and Family Studies with the thought of getting her master’s in social work. She participates in the Hub at LSU, loves hunting, and enjoys spending time with family and friends. • Freshman maid Kelly Luong is the daughter of Lisa and Mike Luong. Kelly is an active member of Parkview’s tennis team and a member of the French Club. Her outside hobbies and interests include reading, playing piano, cooking, and going to the beach. • Freshman maid Cameron Small is the daughter of Beth and Kyle Rogers and Brett Boudreaux. She’s competed with Louisiana Cheer Force for the last seven years, and this is her first year cheering at Parkview. Cameron’s a member of the International Club and enjoys spending time with friends. • Sophomore maid Kacie Phillipe is the daughter of Devin and Cherron Phillipe. She is a member of the French Club, Beta Club, and FCA. Kacie has been a cheerleader since fifth grade, and she runs track. She especially enjoys spending time with her family and friends. • Sophomore maid Krisya Recinos is the daughter of Roberto and Thelma Recinos. She’s an active member of the Spanish Club, British Culture Club, Beta Club. Krisya is the principal clarinet player in the band. She enjoys reading, music, taking care of her pets, and serving as a witness for Christ in the community. • Junior maid Haley Loyacano is the daughter of Gene and Jan Loyacano and Lori and Gary Perkins. She serves the community as a member of PBSU and Beta Club, and is a member of the Spanish Club. Haley enjoys playing tennis, hunting, competing in pageants, spending time with friends and family, and going to church. • Junior maid Jessica Perkins, the daughter of Mike and Cora Perkins, is this year’s chaplain for the Class of 2014. For the last three years, she’s been a member of the Silver Steppers and the PBS Drama Club. Jessica enjoys spending time with her friends and spending time with her family. • Junior maid Lexie Taylor is the daughter of James and Linda Taylor. She enjoys spending time with friends, going to the beach, and spending time with family. Lexie’s a three-year member of the volleyball team and this year she has joined the Spanish Club and FCA. • Senior maid Jessica Breaux is the daughter of Darrin and Jennifer Breaux. She’s led worship as part of the high school’s Praise Band for the last four years and has performed in the Spring Musical for the last three. Jessica is a member of the Beta Club and the Drama Club, too. She enjoys singing, spending time with friends and family. • Senior maid Taylor Causey is the daughter of Michael and Carmella Causey. She’s a four-year member of the youth group at Parkview Baptist Church and is serving this year as a member of its leadership team. Taylor’s vice-president of the Art Club and is a member the Beta Club and Book Club too. She enjoys drawing and painting, reading, watching Disney movies, and “Pinteresting.” Taylor plans to attend either Centenary or Baylor and wants to major in either zoology or marine biology. • Senior maid Jenna Griffin is the daughter of Dr. Jeff and Pamela Griffin. She is a member of the Beta Club and FCA. Jenna enjoys going to church at Istrouma Baptist, going to the movies, staying active, and baking sweets. She plans to attend LSU next fall. • Senior maid Rebecca Tatum is the daughter of Jim and Julie Tatum. She’s a member of Istrouma’s youth group, the secretary of FCA, and a PBS Ambassador. Rebecca’s a three-year member of the Beta Club, a two-year member of the Spanish Club and tennis team, and a four-year member of the Art Club and the PBS volleyball team. She enjoys shopping, travelling, snow skiing, fishing, and spending time with her dad. She plans to attend either LSU or Tulane in the fall to pursue a career in medicine. • Crown bearer Miss Claire Kubelka is the daughter of Kris and Tammie Kubelka. Claire was escorted by the 2012 Homecoming King, Tyler Fontenot.